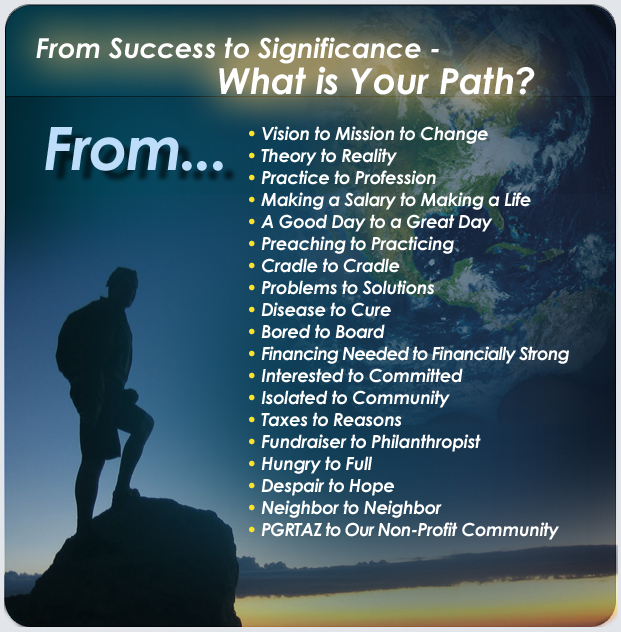 This years’ theme: From Sucess to Significance is fully focused on WHY we support philanthropy, we we give, why we care. It is about personal growth, community, results, and building a better future. Our nationally recognized speaker line-up is not to be missed! The 18th Annual Summer Forum, scheduled for Jun 13, 2012 at Phoenix Country Club, is PGRTAZ’s hallmark event. the exemption equivalents ($5 million for individual taxpayers and $10 million for married taxpayers) is critical. We don’t know if this opportunity will still be present after December 2012, but we do know the opportunity for financial professionals to serve their clients well is here now! PGRTAZ wants to aggressively join forces with our professional planning community and members to spread the word about the impact, the tools, and the psychology for capitalizing on lifetime and estate giving through 2012.